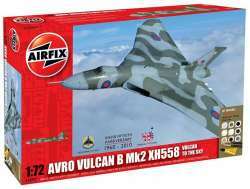 Massive kit from Airfix of the Avro Vulcan B Mk.2 which is issued as a Falklands Gift Set to commemorate the 25th Anniversary of the Falklands War. This Gift Set includes 15 paints, a paint brush and glue. The Avro Vulcan was Britain's major nuclear deterrent bomber for over 25 years. The Vulcan was later adapted for low-level strike missions and it was in this role that it is now remembered as, in 1982, a lone Vulcan bombed the runways of Port Stanley airfield in the Falkland Islands. This raid was historic in that it was the longest ever bombing raid which required numerous in-flight refuelling operations. XH558, Vulcan Display Flight, RAF Waddington, 1992. XH562, No.9 Squadron, RAF, 1977. XM607, No.44 Squadron, RAF, August 1982. XL321, No.617 Squadron, 1963. (with Blue Steel bomb).